March 29, 2011 – Family Tree DNA posted the results of the lastest 37-marker Y-DNA sample this evening. 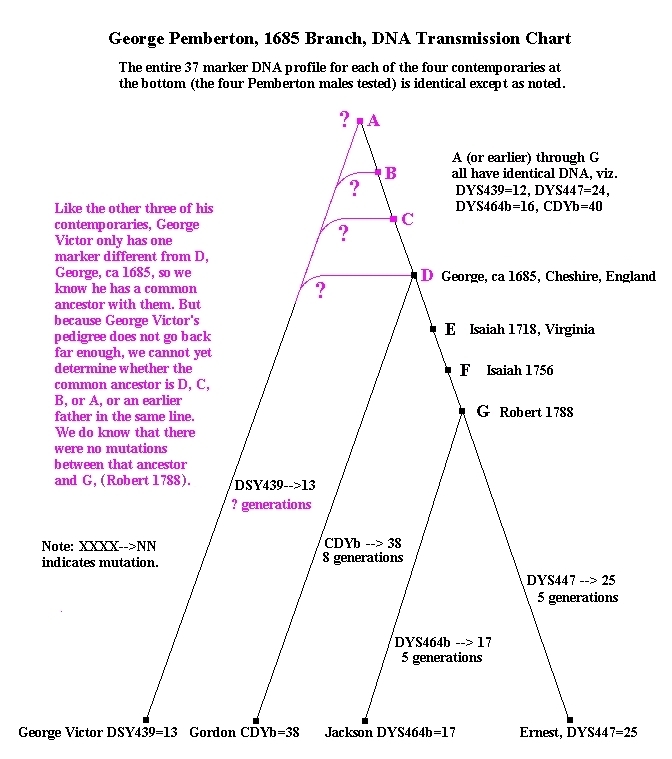 From it we can infer with high confidence, that we know the entire Y-DNA profile for George Pemberton, born about 1685 in Cheshire, England, and emigrated to the Virginia Colony in 1710. This same DNA profile was carried down three generations through his son Isaiah, his grandson Isaiah, and his great grandson Robert. How do we know that? The three markers and their respective modes’ values are: DYS447=24, DSY464b=16, and CDYb=40. The other 34 markers all have the same value in all three samples. You can see all these on the Family Tree DNA website where the Pemberton DNA Project is hosted. This chart (opens in a new window so you can keep reading here) shows each of the samples tested as a row, and the values of the 37 markers tested in each sample as columns. Now an aside for a moment to help you understand the chart: The marker value shown in each column of the “Mode” line (see line 3 in the chart) are the ones that dominate – meaning that most of the samples have that value in that marker position. You can plainly see this if you scan up and down in a column. Because all these samples come from males surnamed Pemberton, we can infer with great confidence that their common ancestor had the exact DNA profile shown in the Mode because if he didn’t, those values could not dominate the samples of his progeny. In July, 2012, a Pemberton’s DNA sample was added to the project as kit number 226792. Because this sample is exactly the same as the “Mode” it is clear that this Pemberton has the exact DNA of one of his fathers for at least 7 generations back – there have been no changes in the Y-DNA markers being tested. Because his is a perfect match to the Mode, none of the markers in his row are highlighted in color. The three DNA samples mentioned above are shown as Kit Numbers 187524, 193161, and 194597. Look for them in the chart and notice that each one has one marker (shown highlighted in his row) different from the Mode line. The fact that they have only one marker different is proof that they have a common ancestor not too many generations earlier. The documentary research done on the ancestry of the males of these three kits confirms this as shown below. Meanwhile, here is a graphical represtation showing the transmission of George’s DNA and the mutations that have occurred. The first sentence after the title is the most important one on the whole graph. Here is the full article on Pemberton DNA results.